Meet and Greet packages are available at http://future-beat.com/event.cfm?id=278609&cart. The band has spent a long time getting to this level; the years have been invested in getting things right: the sound, the feel, the experience. Whilst the Daily Telegraph rightly described them as being at “the top of the tribute band tree”, the journey has been a long one and began in 1988 in Adelaide. Lee Smith, a local guitarist obsessed with Pink Floyd, and needing to augment his band [featuring drummer Grant Ross and bassist Trevor Turton] placed an ad in Allan’s Music store. It read: “Vocalist and Keyboardist required for band. Professional attitude expected. We only play Pink Floyd”. Steve Mac and Jason Sawford each saw the ad and soon the now five-piece band commenced regular weekly practice. Whilst learning and practicing the songs they constantly referred to Lee's extensive collection of Pink Floyd albums and bootleg recordings. They also started to create the sounds necessary to perform Pink Floyd correctly, and this became, and still is, one of the most important aspects of the band. The first live show was performed to a select group of family and friends – including Richard Guest and Greg 'Bear' Sutton, both of whom would serve time in the band’s road crew. Having settled on the name ‘Think Floyd’, the quintet soon secured their first paying gig at the Alma Hotel. More gigs followed with the band banking $600AU for a show at the Tivoli witnessed by Colin Wilson, who would later join them. Though the reaction was positive, it seemed hard to find a regular audience, and the line-up drifted apart, until 1992 saw a refocusing and a redoubling of efforts. Peter Whitely replaced Trevor Turton and the band aimed for bigger and better, often using a quadraphonic sound system that they ended up lugging to venues themselves. The band was back on track, and soon had their first big break. While on a trip to the UK to visit family, Steve Mac made contact with the publishers of 'Brain Damage' magazine, the biggest Pink Floyd fanzine at that time. Glenn Povey, the owner of the magazine, was planning a Pink Floyd fan convention at Wembley in August 1993, and decided that 'Think Floyd' should perform. In order to raise money for the trip, the band began gigging furiously in Australia, clocking up serious miles but honing what they did ever more. Colin Wilson was drafted in to replace Peter Whitely who could not make the trip to the UK. The five band members, plus long time 'roadies' Richard Guest and 'Bear' Sutton, boarded their BA flight to Heathrow on August 8, 1993. Upon arrival, British customs impounded all their equipment! Not a good start but everything was back on track for the warm up show on Friday 13th... The band by this time had changed their name to 'The Australian Pink Floyd Show'. At the convention TAPFS put on a three hour spectacular that is talked about to this day. Glenn Povey was so enthused that he started booking the band more shows, and would continue to do so for three years. 1993 had been an incredible year - but it ended with the departure of homesick founder Lee Smith, and also ‘Bear’ Sutton. During 1994 the band's audience continued to grow, not just in the UK but also in Europe. Then, in September of that year, came a show which changed everything. David Gilmour visited the band backstage after a show in Croydon, pointing out that he’d never had the chance to see Pink Floyd perform. He was very complimentary, posed for pictures and invited the band to perform at Pink Floyd’s party to mark the end of their “Division Bell” tour. Due to curfew restraints at the venue, this plan fell through but, when the phone rang not long after, the band found themselves asked to perform a handpicked set at an event marking Gilmour’s 50th birthday. The Australian Pink Floyd Show topped the bill at the evening’s festivities at the Fulham Town Hall, performing Pink Floyd to the members of Pink Floyd themselves, and other stars. Toward the end of the performance Pink Floyd bassist Guy Pratt joined the band on stage along with Rick Wright for a rendition of “Comfortably Numb”. This was followed by David Gilmour, Gary Wallis, Tim Renwick and Claudia Fontaine, along with Guy and Rick, performing a number of edited versions of Floyd songs including “Money” and “What Do You Want From Me”. It was an incredible ending to an unbelievable night. Following that was always going to be hard, but it gave the band impetus to push forward even harder and deliver amazing shows for their fans. In 1997, the band performed a show at Battersea Power Station - the iconic building known to all Pink Floyd fans as the “Animals” album cover, and the scene of the famous flying pig. 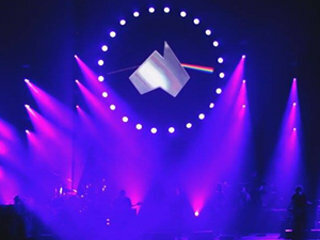 The Australian Pink Floyd Show’s similar image of a flying kangaroo had been used to promote the band since the early days. 1998 saw the band perform at Glastonbury Festival. TAPFS were confident of drawing a good crowd but the fact that they had been added to the Acoustic stage – which had a roof – meant that there was standing room only, in a year famous for rain and, of course, mud. This was the year too when founder member Grant Ross decided to return to Australia, as did Richard Guest. Though the losses would be keenly felt, the band regrouped and Salford lad Paul Bonney and his two drum kits were welcomed into the show. The band’s touring schedule continued on an upward trajectory over the next four years, the band getting tighter and the venues getting bigger. In 2003, the band were faced with a choice: to keep doing the same as they had for the past 10 years, or to step up a gear. TAPFS made a big decision and embarked on their most ambitious period to date. 2003 was the 30th anniversary of Pink Floyd’s landmark album “The Dark Side Of The Moon”; there was no better time for TAPFS to perform this album in its entirety. Backing vocalists and saxophone were added to the line up and new , improved animations were produced for the tour. The band toured “TDSOTM” throughout 2003 and into 2004, taking the whole show to North America for their first full tour, and continuing in Europe. Everywhere the band played they received incredible reviews and it seemed the world had now fully embraced TAPFS. The tour continued well into the next year and a DVD of the show was recorded in Liverpool at the ‘Summer Pops' show. The 30th anniversary of the legendary “Wish You Were Here” album fell in 2005 and was marked by a slew of UK dates, a tour in South America and a show in Malta that drew 10,000 fans – including the Maltese Prime Minister – and was acclaimed as the nation’s largest ever paying concert crowd. The annual Liverpool ‘Summer Pops’ in July 2005 gave the opportunity for TAPFS to make another first. On July 15th the band performed and recorded “Wish You Were Here” and, on the following night, performed “Animals” in its entirety for the first time. The end of 2005 saw TAPFS back in North America for a 35 date tour. In 2008 the band celebrated its twentieth year as the shows kept rolling and the band kept on doing what they love. The tours continued to extend, the audiences increased and the venues became larger, with the band playing Wembley Arena for the first time in 2009, followed by London's O2 Arena in 2010. The 2011 dates saw the debut of some remarkable 3D projections, the first time this had been attempted extensively by any touring band. This Year also saw the band enlist the talents of David Domminney Fowler, Alex McNamara and the backing vocalists Emily Lynn, Lara Smile and Lorelei McBroom. Lorelei was also one of the backing vocalists who performed on Pink Floyd’s ‘Delicate Sound of Thunder Tour’ In the same year Guy Pratt made a guest appearance with the band at Hampton Court Palace. The following 3 years saw the band perform at major European rock festivals and go on to produce 3 DVDs of their shows. In 2013, the 40th anniversary of “The Dark Side Of The Moon” was celebrated with a brand new tribute to the classic album, performed to capacity audiences in Europe and at the band's first ever concerts in Russia. TAPFS have constantly striven to seek out new audiences and turn in jaw-dropping performances to reconnect people with the music that they love. Next year will bring more innovation, hard work, and great crowds, demonstrating that it is still all about the great music of Pink Floyd and delivering the absolute best performance each and every night.